Before–and–after photos show how climate change is affecting South Africa. From these pictures, researchers are making predictions about other regions. But can anything still be done about it? Timm Hoffman's work is a bit like a treasure hunt – with handwritten instructions: "Drive 40 miles south from the post office, and then ten miles east in the valley." Such are the signposts that Hoffman follows to find a specific place somewhere in South Africa – down to the nearest metre. What guides him are old photos, some of which have been taken more than 100 years ago. Sometimes Hoffman is lucky, and the photographer has written the location on the back of the photo. At other times, he can only guess. For Hoffman, though, it's precisely about that: finding the exact same perspective to repeat the snapshot. And that's the reason for the journey – to be able, later, to put both images side by side, and see at a glance how nature has changed over the decades. South Africa is a country that is being particularly badly affected by global change – both in climate and in land use. In order to document and understand the practical consequences, Prof Timm Hoffman of the University of Cape Town (UCT) travels with his students throughout the country. The landscape photos that they take, matching the old pictures, show the changes that have taken place over time. The photos of some regions are alarming, and the difference between the old and new photos serves as a warning for the future. The looming dangers are water shortages, loss of biodiversity, and the loss of open savannah landscapes. The biggest changes are in the landscape of eastern South Africa. What was once open landscape is now overgrown. The forest is taking over the bush and savannah. The animals that live there, such as zebras, giraffes, wildebeest and leopard, are losing land. Farmable land is also becoming smaller. The only region in South Africa where the spread of trees is still being held back is in the Kruger National Park, Hoffman says, explaining that it is thanks to big animals pushing back trees and shrubs. Anyone who has ever gone on a safari in the park will have seen numerous trees that have been bent like matchsticks and destroyed by elephants. However, if the population of elephants – for whatever reason – should decline significantly, large parts of the Kruger Park would become more wooded. The increase of woodlands in South Africa is not only the result of climate change and an increased concentration of carbon dioxide in the atmosphere: due to the increased fragmentation of the landscape, fires cannot easily spread over large areas. They are stopped by the roads. Previously, a fire could destroy much larger areas of woodland. There is a controversial viewpoint that humans should perhaps intervene by artificially starting fires in order to regulate the ecosystem. "The diversity of species will decline," says Hoffman. "This will not only concern the bigger animals in the open grasslands, but also the birds and insects." The sprawling woodlands will also displace many types of plants. Hoffman's assessment: "The environmental changes documented by our photos can be dramatic." Hoffman started his photo comparisons project 25 years ago. "I now have a collection of more than 20 000 historic landscape pics," the botanist says. And in the case of at least 1 500 photos, Hoffman and his team have succeeded in taking current photos that are almost identical to those in the archives. Since the 19th century, photos have been used by scientists for documentation. At that time, botanists and ecologists used the fledgling technology to capture and map the rich flora of South Africa and Namibia. Over the years, geologists – searching for valuable mineral deposits – forest researchers, hikers and various amateur photographers have also built up numerous landscape collections, which they have now donated to science: "I have some great pics here, would you like them?" Timm Hoffman also receives such offers from private individuals, when they hear about his extraordinary research project. The oldest image in Hoffman's collection dates from 1876 and shows a landscape in Namibia. Until the 1950s, mainly black–and–white images were produced; thereafter, primarily slides. Hoffman still goes into the field with three cameras. For black and white photos he uses a Japanese Mamiya 645 – a medium–format camera that is also used by advertising and fashion photographers. For colour photos, the researcher uses a Minolta SLR (single–lens reflex) camera. For the analytical work on a computer, digital images are also needed. For this purpose, Hoffman uses a Canon 5D Mark II, with 23 megapixels of memory. "I use all three cameras, to take about 10 to 20 photos from one position," says Hoffman. To find this position is not an easy task. Many of the historic photos don't include directions. In those cases, Hoffman can only orientate himself by the use of characteristic landscape features such as mountain ranges. The final task – to find the exact position from where the photo was originally taken – is still a huge challenge. The photographing is of course only one aspect of the work, Hoffman stresses. Before each photo, he walks carefully through the area to examine the ecological situation. Which plant species are represented here? Which of them are invasive species? How close is the growth? All these things are noted in detail in Hoffman's 'lab notebook'. These notes, together with the before–and–after images, are the foundation of his interpretation of the differences in vegetation. "The changes are enormous," reports Timm Hoffman of the work done to date. There is no uniform trend – climate change impacts the different regions of South Africa very differently. The deserts in the west of the country are stable. On comparing old and new pictures here, you can only see a few differences. A look at the eastern edge of the desert, however, does reveal change. Here, grasslands invade desert areas. The desert retreats. According to Hoffman, this is unique in the world. Globally, desert surfaces are increasing; and consequently, experts have predicted that in South Africa, the deserts would also push back the grasslands. Hoffman's photos, however, show the opposite. This South African exception could be explained by the increase in rain during springtime, which promotes grass cover and its expansion to the west: "The increased concentration of carbon dioxide (which acts as a plant fertiliser) certainly also plays a role." 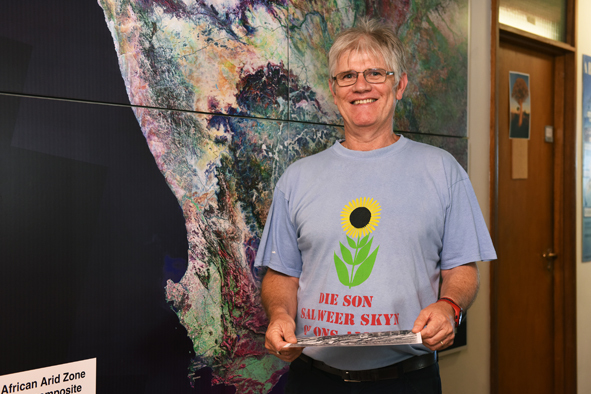 The speed at which the vegetation in South Africa could change has also been investigated by Simon Scheiter of the Senckenberg Nature Research Society in Frankfurt am Main, with Steven Higgins of the University of Frankfurt. With the help of computer models, they discovered that the increase of carbon dioxide in the atmosphere could lead to sudden changes in South African vegetation – for example, when an open savannah with few trees becomes a dense forest. "We are dealing with a bistable ecosystem," Scheiter explains. The transition from the one landscape to the other could take place within only 10 to 20 years. The mechanism of bistability is simple: more carbon dioxide, higher temperatures and more rainfall promote the growth of trees. They rob the grass of light, and thus reduce its chances of survival. In the end, there is only dense forest everywhere. This is true not only for South Africa. Scheiter has also used his model to calculate the changes in vegetation in Australia. The result: it appears forests are also on the rise in Australia. But is the spread of forests not a good thing? Isn't it always lamented that too many trees are being cut down? Are forests not a major reservoir for atmospheric carbon dioxide? Both Simon Scheiter and Timm Hoffman are very sceptical. It is true that the expanding forests absorb more carbon dioxide; however, this effect will not be able to stop the overall increase in both carbon dioxide and climate change. "I expect only a small braking effect," says Scheiter. The ecological disadvantages of forestation are far worse. This is confirmed by Hoffman. The ongoing climate change also threatens the biodiversity of South Africa for another reason. Some alien species are displacing native plants, because they are adapting better to the new environmental conditions. This is especially true for the fast–growing trees that were brought to South Africa from Australia. The different types of eucalyptus trees have become particularly problematic – they are not only spreading out rapidly, but also consuming a lot of water. The water they extract from the ground is taken away from other plants, and from farming. In addition to these Australian imports, the pine trees that were originally brought to South Africa from Europe are also a cause of great concern to ecologists. Agriculture (including the production of wine) is, after mining, the second largest contributor to the gross domestic product of South Africa. The looming shortage of water is therefore a highly explosive topic. Many of the research projects that focus on the effects of climate change are being financed by funders who mainly focus on the study of sensitive water management. The government is doing something – it is fighting the spread of alien plants with the help of physical and chemical methods. But success is only possible in small regions. Another option being considered is to import specific pests from these alien plants& home countries, which could act as biological weapons and keep the plant populations in check. This approach, however, is controversial, as it is hard to assess what unwelcome side effects these pests could have on ecosystems. Some researchers believe that climate change in southern Africa has also hit Hoffman's favourite tree: the quiver tree (Aloe dichotoma), which grows up to nine metres tall. Its characteristic silhouette shapes parts of Namibia and the Northern Cape. A recent IUCN article lists Aloe dichotoma as a flagship climate-change species. Hoffman believes that his photographic research can help predict the development of South Africa's vegetation in the future. From developments to date it is possible to predict further trends. The more before–and–after photos there are, the more meaningful the interpretations and predictions will be. The search for the correct photograph locations somewhere in the vast expanse of South Africa is a time– and labour–intensive exercise. Few researchers would be able to visit and retake Hoffman's 20 000 photographs, not even in decades. This type of research, however, is often interesting for amateur scientists, hikers and adventurers. When Hoffman noticed the great interest of many citizens in his research, he hit on the idea of including them in the project. These 'citizen scientists' enjoy going on expeditions as scientific scouts. "Anyone who is interested is welcome to participate," says Hoffman. He has created the rePhotoSA website for this purpose, where he has saved 5 000 landscape photos that are still awaiting current comparison photos. Amateur researchers don't receive any payment, but have access to plenty of information about how to get started on the website. Why not do something for science, if you are planning an outdoor holiday in an affected region anyway? This approach could give many a tourist an extraordinary perspective. Original story by Norbert Lossau, Head of Science, Die Welt, translated by Birgit Ottermann. This story originally appeared in Die Welt am Sonntag. Repeat photographs courtesy of Timm Hoffman; photograph of Timm Hoffman by Michael Hammond.